Mindy Solomon Gallery presents The Flaunting of Youth by Einar and Jamex de la Torre and Raw Horse Power by Generic Art Solutions (G.A.S.) on view November 28th, 2016 through January 14th, 2017 at the gallery: 8397 NE 2nd Avenue, Miami, in Little River. An opening reception with the artists will take place Monday, November 28th, from 6–9pm. The opening reception party features —a unique boutique mezcal created by Mexican American actor and famed Chicano art collector Cheech Marin. 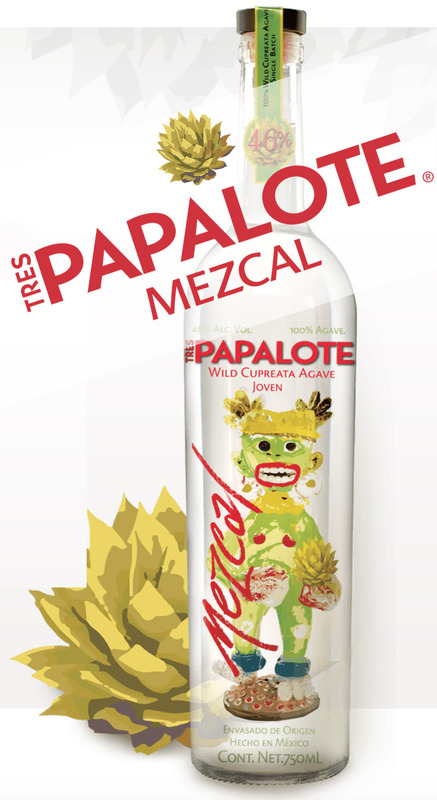 The Tres Papalote® label showcases an image of a glass sculpture skillfully crafted by artists Einar and Jamex de la Torre. The figurine on the bottle is inspired by the de la Torres' colorful fun-loving work in Cheech’s own art collection. Capitalizing on their always prescient, tongue-in-cheek perspective on Colonial History, the de la Torres explore a juxtaposition of consumerist gluttony and the Sunshine State population’s obsession with eternal youth and vitality. Utilizing the medium of lenticular technology, Einar and Jamex de la Torre create vibrant images of raw meat, celebrity personas, and historical artifacts to articulate a dizzying array of fantastical images that transition between varying states of reality. “It always surprises us when somebody dies in the US, there are no reminders of death—even the cemeteries look like golf courses and parks. Nowhere else do you see a culture so obsessed with youth. We like to say that America is a young country; America is not so young anymore. Nowadays, it is acting more like a perpetually juvenile middle-ager— immature adults are never a pretty sight, the best example of this is in our current election. Choosing to focus on lenticulars exclusively for this exhibition will be a departure from previous shows, as the brothers have always utilized hot glass as one of their primary media. 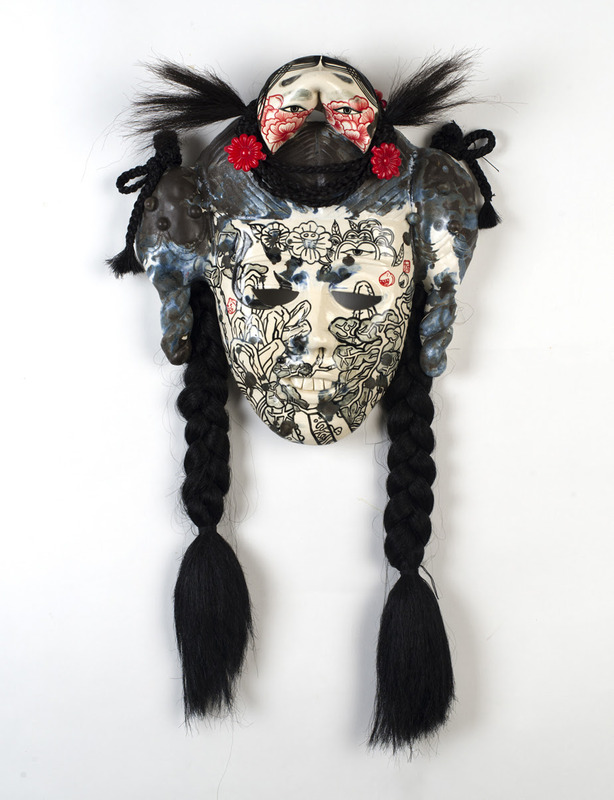 Expanding their artistic reach beyond the traditional craft realm, they see themselves as representative of the contemporary Latin American artistic vanguard. The de la Torre brothers will be the featured inaugural exhibition at the new Smithsonian Latino Center in Washington, DC in 2018. They have received national and international acclaim and professional recognition, including a USA Artist award, Louise Comfort Tiffany Foundation grant, and a Joan Mitchell award. when it ceases to be dangerous you don't want it. In their second solo exhibition at the Mindy Solomon Gallery, Generic Art Solutions brings a new and theatrical direction to their work. Having recently completed the prestigious Rauschenberg Residency, the artistic duo focuses on work that challenges the notion of cooperation. A considerable amount of the collaborative duo Generic Art Solutions’ sculptural/performance/video work explores, at its core, the very nature of collaboration itself. 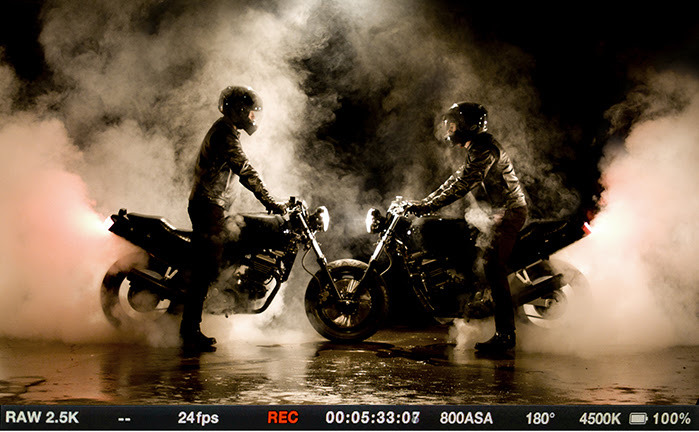 “Streetfighter: Ninjas” (2016) is a high-octane performance piece that is centered upon conjoined motorcycles that share one front wheel. Though this vehicle cannot be ridden conventionally, it is perfectly designed to perform head to head dual burnouts. The motorcycle is the universal symbol of youth rebellion and freedom, and an icon of the American Dream with loud, smoky burnouts as its exuberant war cry. This performance requires a dance of power, where only precisely matched RPMs, as well as break and clutch control by both riders, results in an extended battle of Raw Horsepower. Neither rider may take the lead--this tango has two leading men--in order to sustain a balance of aggression and surrender. Both Campbell and Vis must maintain constant focus on the other’s actions. It is a head-to-head arms race, a stand-off in smoke and burnt rubber with equilibrium as its ultimate goal. 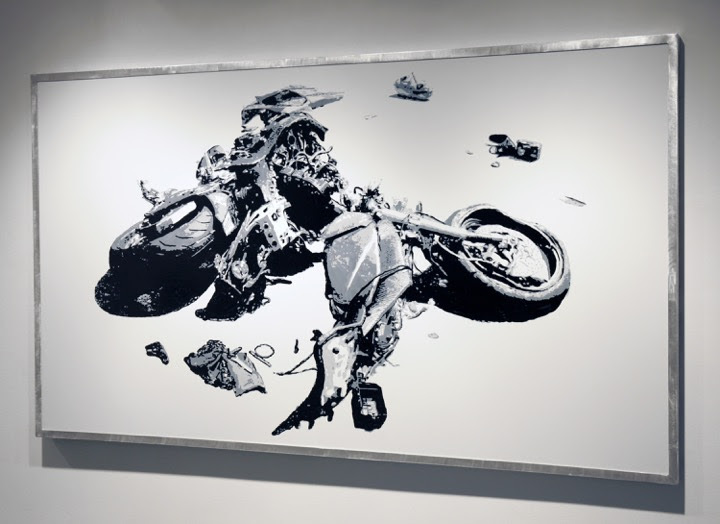 In addition to the video and the accompanying large scale three-dimensional motorcycle piece, the duo will showcase paintings that focus on twisted motorcycle wreckage that appears sculptural and abstract in its articulation, as well as recent photographic images referencing historical works. Please join us in congratulating Mindy Solomon Gallery artist Jiha Moon as one of the two recipients of the 2016 Atlanta Artadia Award. “Jiha Moon is in a perpetual state of “other” as she mines numerous histories and cultures, distilling them into rascally works of art. There is no filter, just a quirky mix matching flurry of references. Mischievousness, rebelliousness, Jiha is the Bart Simpson of our scene and she perfectly exemplifies the new Atlanta." Brothers Einar and Jamex de la Torre were born in Guadalajara, Mexico. Jamex in 1960, Einar in 1963. They moved suddenly with the family to Southern California in 1972, going from an all-boys Catholic school to public schools in the beach town of Dana Point. They are presently living and working on both sides of the border with studios in Ensenada, Mexico and San Diego, California. Jamex started flame-working glass in 1977, attended California State University at Long Beach, and received a BFA in Sculpture in 1983. Einar started work with glass in 1980, while also attending California State University at Long Beach. In the 1980s, they ran a flame-worked glass figure business while also developing their assemblage style of work. In the early 90s, they began working collaboratively as studio artists; later in the decade, they began work in installation art with participations in Biennales such as inSITE and Mercosul (Brazil). In the year 2000, the brothers began their work in public art; they now have six major projects completed. They have exhibited their work internationally, participating in exhibits in France, Japan, Canada, Germany, Venezuela, and Brazil, as well as the US and Mexico. Their work is in the collection of the Museum of Glass in Tacoma, Washington; The National Hispanic Center Museum, Albuquerque, New Mexico; Arkansas Arts Center Museum, Little Rock; Arizona State University Art Museum; San Diego Museum of Contemporary Art; Kanazu Museum, Japan; The Fisher Gallery Museum USC, California; Tucson Museum of Art, Arizona; Santa Barbara Museum of Art, California; and The Mexican Fine Art Center Museum in Chicago. They have taught workshops at institutions such as Pilchuck School of Glass, Penland School of Crafts, Ezra School of Glass in Japan, Build-Work Academy in Bavaria, Jam Factory in Adelaide, Australia, and Northlands Creative Glass Centre in Scotland. Their work is included in the private collections of Cheech Marin, Elton John, Terry McMilan, Sandra Cisneros, and Quincy Troupe among others. Generic Art Solutions is the collaborative efforts of Matt Vis and Tony Campbell. 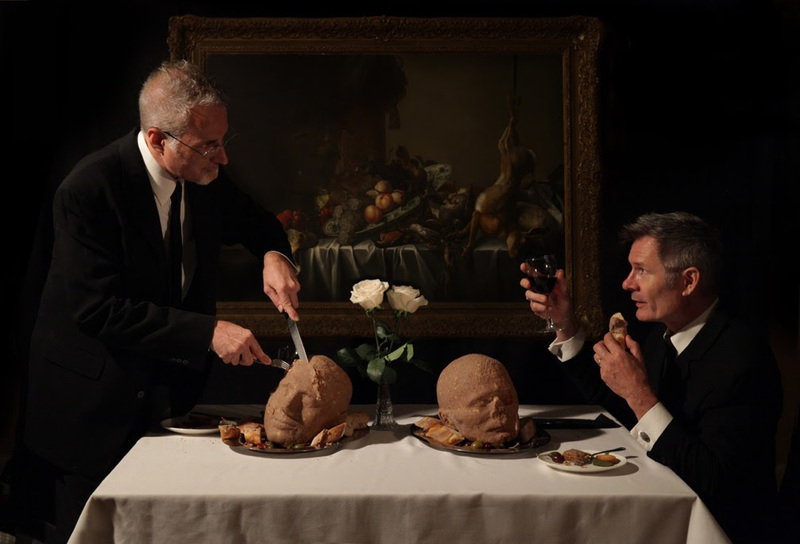 This New Orleans-based art duo utilizes nearly every art medium as they examine the recurring themes of human drama and the (dis)functions of contemporary society. Always rooted in the performative, they play every character in their work. In their more distilled “duets” we see something of a yin and yang (a balance between individuals that aren’t quite interchangeable), but in their more elaborate stagings the resultant effect is as epic as the subject matter itself. By combining Classical, Romantic, and Baroque compositional elements with contemporary pictorial techniques, they manage to illuminate the common thread that connects past histories with current events. This strategy creates something of a “Déjà Vu effect” that is driven by drama and surreality with traces of levity. In this dialogue between the past and present the viewer realizes several things: 1) that the history of art is inextricably political, 2) that human behavior repeats itself no matter how tragic or brutal, and 3) that this cycle of repetition must be broken so personal and societal progress can be made. Despite all this, their work contains a glimmer of hope--a hope that through thoughtful examination (and armed with a commitment to change) we can indeed forge a better future. Established in 2009, Mindy Solomon Gallery specializes in contemporary emerging and mid-career artists and art advisory services. 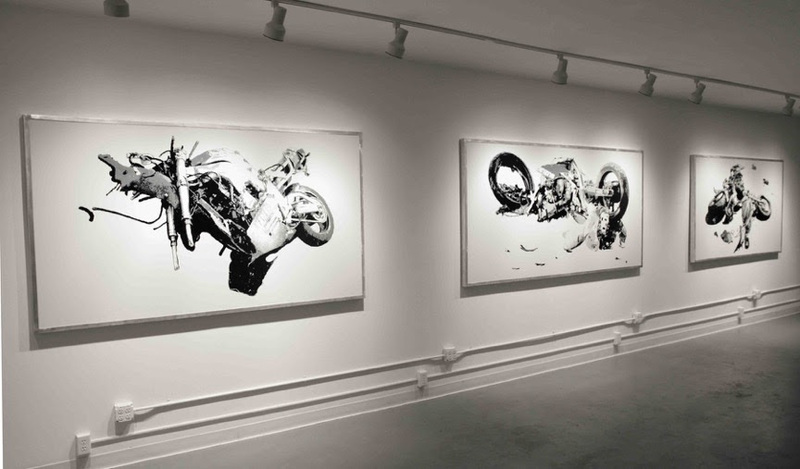 The gallery represents artists working in painting, sculpture, photography, and video in both narrative and non-objective styles, and was named one of the Top 500 Galleries Worldwide in Louise Blouin Media Modern Painters 2013 and 2014 annual guides. The gallery serves as an incubator for dynamic artists establishing their creative voices and exploring a broad range of exhibition possibilities. Represented artists include: Scottish photographer Muir Vidler, LA photographer and writer Scot Sothern, Korean sculptural artist Kang Hyo Lee, Mexican mixed-media artists the de la Torre brothers, and an array of national and international talent. Mindy Solomon Gallery participates in global art fairs including Art Miami, Zona Maco, VOLTA BASEL, VOLTA NY, PULSE, Moving Image, and Shanghai Contemporary. 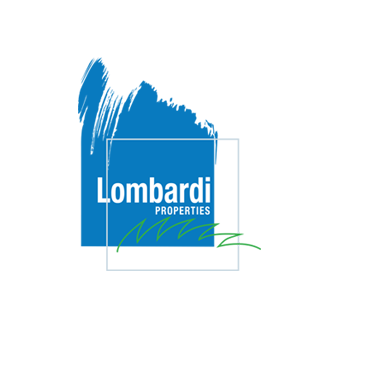 Always interested in the intersection of art and design, Mindy Solomon and her staff work closely with designers, advisors, consultants, and curators to inform and integrate fine works of art into every aesthetic environment. Mindy Solomon Gallery is open from 11:00am-5:00pm Tuesday through Saturday; call 786-953-6917 or email info@mindysolomon.com for more information. Copyright © 2016 Mindy Solomon Gallery, All rights reserved. You are receiving this email because you have opted in to our mailing list.